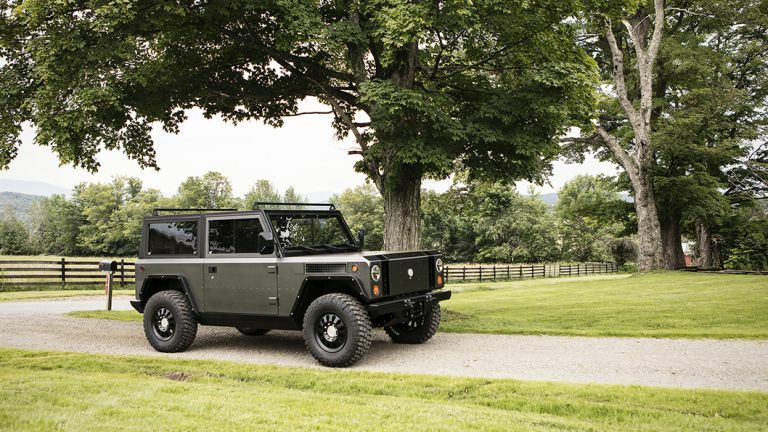 This is the Bollinger Motors B1 and we think it looks vaguely familiar… Yep, there’s a fair amount of Land Rover Defender in there, but the Bollinger is an all new vehicle, underlined by a powerful electric all-wheel drive system. The prototype was revealed in Manhattan over the weekend, and it packs some pretty serious specs. First up, the Bollinger has not one, but two electric motors driving all four wheels, all the time. The company claims the power output is 360bhp and produces a hefty 472 lb ft. torque. That's enough to launch it from 0 to 62 mph in just 4.5 seconds, and onto a top speed of 127mph. This is helped, in part, by the lightweight aluminium construction with a strong steel roll-over cage for protection. So far, so good, although, the acceleration times are making it sound more like a Tesla than a Defender. It's practical too, with a maximum load space of 2690 litres. It can carry almost 2.8 tonnes of… stuff, and can tow almost 2.8 tonnes of stuff, too. Thanks to the pass-though hatch inside the cabin, the B1 can fit 24 2x4 lengths of wood measuring up to 3.6 metres long, without having to have the boot open. There is a 60kWh model and 100kWh model. The former has a range of 120 miles, while the latter has a 200 mile range. There's fast charging too, with a 45 minute and 75 minute charge time respectively. There's one problem, however, and that's traditional Land Rover Defender owners. We're already expecting them to be up in arms when JLR release a new Defender with a radio and windscreen wipers that actually work, so persuading them to swap their trusty steed in for a all-electric truck may be too much to ask. A retail price will be announced at a later date, but if you're interested, you can reserve one now by heading over to Bollinger Motors website.